Please click on the links below to review the Districts rates. Various options are available for the payment of water bills. If you choose to send a check for payment please send it to the following address. You may also have automatic payments made through your bank or Credit Union. If you have done this in the past please notify them of the change of address. Another option is to place your payment in the drop box to the gate at the front of the water plant (2270 Cape Meares Loop Road). 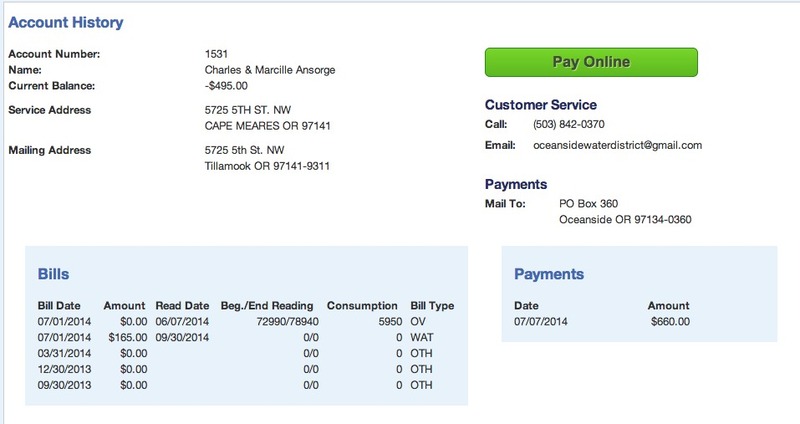 Since the Oceanside Water District chose a new billing company for our customers we are pleased to announce that we are now able to offer you an online bill pay. 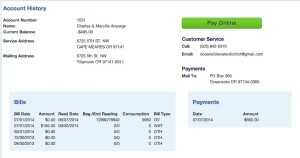 This is a very convenient way to pay your water bill by charging it to your credit card. There is a 2.9% fee that is assessed if you choose to use your credit card for making payment. However, ACH transactions, an automatic quarterly or monthly deduction from your checking account is now offered at no additional cost to the customer. The District prefers payment in full, although monthly or quarterly payments may be made. Monthly payments are due by the 30th of each month. If paying quarterly, payments are due by July 30th; Oct. 30th; Jan. 30th and April 30th. The annual payment is shown under the Service Column on the bill. For monthly payments divide the annual payment by 12. Overage Charges must be paid in full. Past due balances are charged a Delinquent Fee of $7 for each month past due, plus interest at 18% APR on the past due balance. Please remember we only bill quarterly, so if you elect to pay monthly you will need to set yourself a reminder or sign up for automatic payments through your bank or credit union. 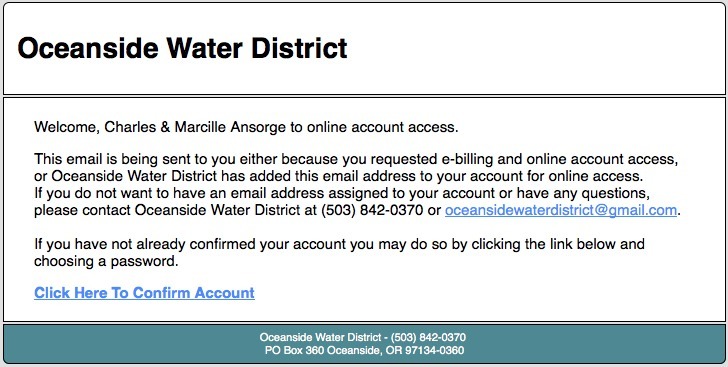 To take advantage of paperless billing, please send us an email to oceansidewaterdistrict@gmail.com with Paperless Billing in the subject line. Please include your name and account number that is on your bill. We will then send you an email that will include a link to your account. 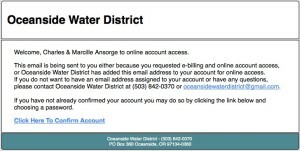 Paperless billing saves the water district time and money and it is an easy way to monitor your account. 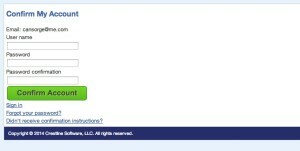 If you click on the link in the message we send you for paperless billing you will view a screen similar to the one shown below. You will be asked to confirm your account. To do this click on the link and be taken to a new screen. 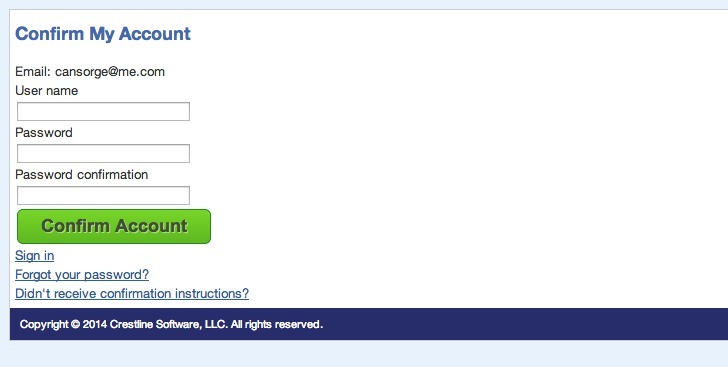 On this screen you will be able to enter a login and password that you will use for accessing your bill information plus payment information. Be sure to save this information for future reference. Click on the green “Confirm Account” button and be taken to a new screen. 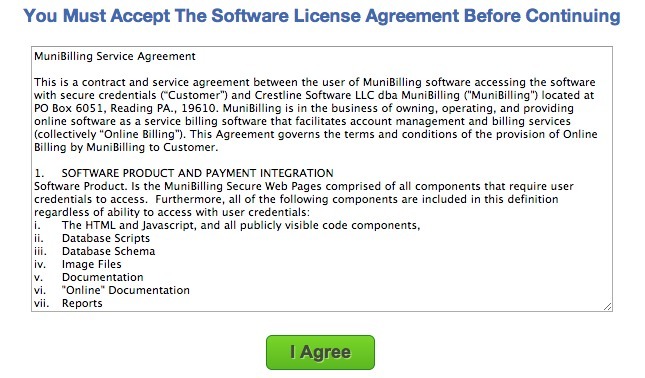 You are asked to accept the Software License Agreement before proceeding. 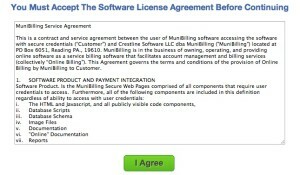 Once you have read the agreement and are satisfied, you may click on the link for agreement and then be taken to your account. The view below is the account of a typical ratepayer for the district. The link below is for MuniBilling. Once the registration process has been completed you will be able to go to this site for making online payment. There is a 2.9% fee that is accessed if you choose to use your credit card for making payment. Remember the base rate that is shown in the attached billing only covers a fixed number of gallons per quarter (the allowance for a single family home is 15,000 gallons) and this varies by the type of account you have. If you exceed your quarterly allowance, any additional water for that quarter will be billed at the rate of $2.70 per 1,000 gallons. Please remember if your account is not in a current position as stated above, you could risk being issued a Lock Off Notice. If we have to issue a Lock Off Notice, for a past due account, twice in a 12 month period, we will require a security deposit in the amount of 25% of the annual billing.